Mud agitator is widely used in mud circulation system to suspend solids and maintain homogeneous mixture. A mechanical agitator is driven by an explosion-proof motor, coupled to a gear box that drives the impeller shaft. The impellers (turbines) transform mechanical power into fluid circulation or agitation. The objective is to obtain a uniform suspension of all solids. During installing mud agitator, it should be placed in horizontal direction and put steady on the purpose place, regulate the limit less than 0.39mm and then weld the four pairs plug on the tank, and screw the bolt. The rigid coupling should install a spring pad to stable and reliable, or it will cause deflection of wave wheel and axle, gear wear and tear. During the operation, it should without any noise, cassette, over high temperature and other abnormal cases happen, otherwise it should be stopped for checking, get rig of trouble. The speed reducer oil level should keep in the middle of oil-watching window, and add enough oil during working. When it can not be available on site, it can be replaced by other lubricating oil. Structure: Small footprint and compact structure. 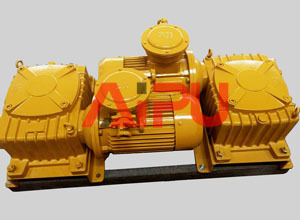 Reduction gearbox: Helical-bevel design or worm design according to customer requirement. Motor: Explosion-proof electrical motor, and can be the style of horizontal or vertical. Shaft and impeller: Galvanizing treatment brings the excellent anti-rust performance much better than the painting process. High efficiency, low noise, low operating temperature. Aipu solids control is a professional manufacturer with very rich experiences on solids control equipment and system, if you are interested in mud agitator or other solids control equipments, please feel free to contact with Aipu solids control for your detail requirement. We will recommend the right specification of every product to meet your requirement. Why shear pump is better than normal pump? How to use drilling mud cleaner properly?